Education has always played a vital role for the political development of a country. But, in the erstwhile Sikkim it was a privilege enjoyed only by the super class. People belonging to the grass root level did not have any opportunity to attend a school. In every society, people began to dream for a better life only after getting closer to education. Hence, it plays an active role in grooming the ideas of democracy inside the ignorant and slumbered minds of the common people. Possibly, the neglected education system of the erstwhile Himalayan Kingdom was highly responsible for the delay of democratic ideas among the Sikkimese peasants. Above all, the majority of Sikkim’s population was that of peasants or ‘Bustiwallas,’ as they were known by the authorities that time, were very much innocent. The economic condition of the kingdom apart from those of the authorities, was not good than the poorest country of the world. The peasants are the backbone of every agricultural country but, the Sikkimese authorities were a mile away from this fact. They never did a mistake to see a peasant from the eye of humanity, if they did so, they knew that they would be in a great lost. The peasant, who always remained busy in serving their masters without any wage, could not imagine a world of freedom. They might have a concept that every nations of the world are moving in the same pattern as their world was moving. Therefore, they made a compromise in their lives, since many generations, to live the very same life obeying the orders of their authorities and getting betrayed from them. There was no question of education in such a situation where one loaf of bread was more valuable then the philosophies of Marx, Engel, Gandhi and Socrates. Moreover, there were no schools in the villages nor were they in the neighbouring areas. Few peasants though, had sent their children to the neighbouring state of West Bengal for their study, of course, not in a good school, but just to get educated. Amid to a Nepali proverb Pade Gune K Kam….Halo Jotey Payo Mam (Nothing is there in reading and Writing plough the field and get food) few peasants have tried their best to set up some schools in distant villages but, their attempts went futile due to the least bothered attitude of the Kazis, the self-styled Masters of the Sikkimese peasantry. It is to be noted here that, in the midst of to the enlightened rule of its reformist ruler, Sir Tashi Namgyal, there was a hold down in opening some schools in Sikkim. Those obstacles were mainly posed by the Kazis and the Thikadars. Further, they even punished the parents for sending their children to the schools. The Kazis and the Thikadars were very much aware to the fact that if the children of a peasant get education, they would never follow their orders. 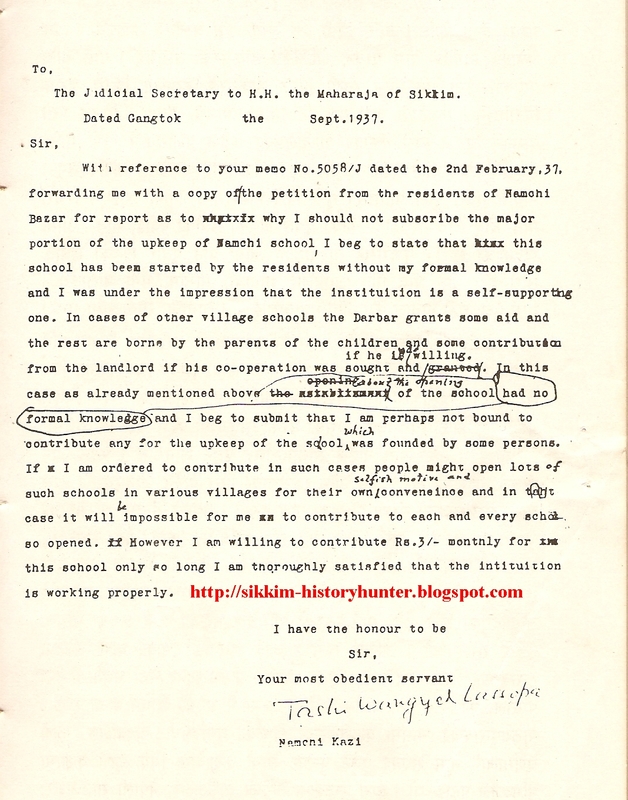 The document along with this post shows how pathetically schools in Sikkim were functioning in those days. 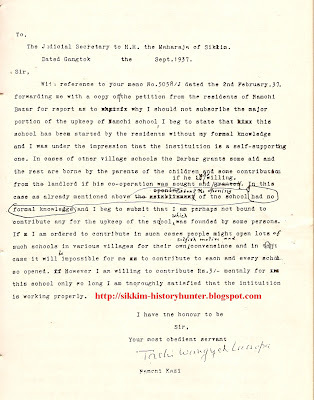 It is a letter sent to Sikkim Durbar by the Kazi of Namchi Tashi Wangyal Lassepa which is related to the commencement of a village school at Namchi. In this letter he has referred the virtuous idea of opening a school as an attempt of the peasants to fulfill their selfish motives. The said school is presently known as Namchi Senior Secondary School which has produced many great politicians and people of extra excellence. The most important students of this school are Mr. C D Rai (A veteran Politician, who has been associated with Sikkimese politics since 1940’s) and Mr. Nar Bahadur Bhandari, the former Chief Minister of Sikkim. The School was established in 1934 with the futurist zeal of the peasants of Namchi. But, their attempts were nearly crushed by the undemocratic and dictatorial system of pre-independence Sikkim. It is a wonder how those illiterate fathers knew the importance of education? These children of those illiterate fathers later became the Messiah to the whole peasantry of Sikkim. To get education in some good institutions was only the inherited right for the children of Kazis, Thikadars and other high officials. They sent their children to some good schools in Darjeeling, Kalimpong and Dehradun for their education. But there children too, even after getting educated in such good institutes, apart from few, never got farsighted. It was due to the innocence and illiteracy of the Sikkimese people they were always betrayed and cheated by their Kazis and Thikadars. The resolutions passed by the International Convention announcing the abolition of forced labour was never explained to them by the Zamindars and the Thikadars (L.B Basnet). Thus, in such an atmosphere to expect democratic idea among the common people in Sikkim was not less than a mirage in a desert.